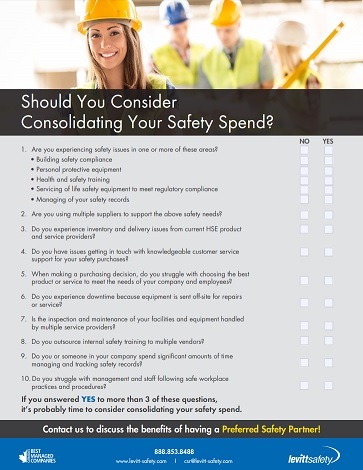 Is It Time To Consolidate Your Safety Spend? Your safety spend probably goes way beyond just PPE – think about building maintenance, servicing of equipment and instruments, the training of your workers…the list is a long one. Consolidating your total safety investment helps you protect your people, your assets, and the environments that you work and live in. Having a preferred safety partner means saving you time, money and most importantly, helps create a culture of safety in your workplace. Not convinced if a preferred safety partner makes sense for your business? Answer these 10 questions to see if having a primary safety partner makes sense to you. Answered YES to more than 3 of those questions? 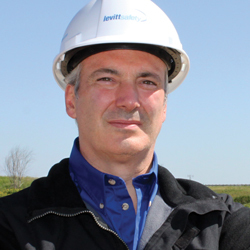 Let us convince you that partnering with Levitt-Safety for your health and safety needs makes sense!